Daniel Williams Harmon (1778-1843), the son of a Vermont innkeeper, joined the Northwest Company in 1800 and became a "wintering partner" in 1818; however, he left the fur trade the following year, deeply affected by the death of his eldest son, and only returned to NWC service briefly in 1820-21. This excerpt from his personal journal (which he kept between 1800 and 1819, and published in the U.S. in 1820) describes the Massacre of Seven Oaks. Sat, Nov 23, 1816 Fraser's Lake. p187-189: "In June a number... Canada." 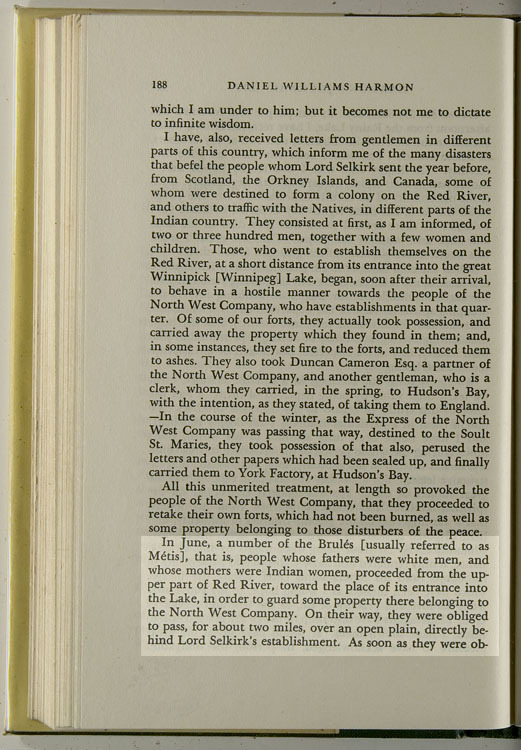 In June, a number of the Brulés [usually referred to as Métis], that is, people whose fathers were white men, and whose mothers were Indian women, proceeded from the upper part of Red River, toward the place of its entrance into the Lake, in order to guard some property there belonging to the North West Company. On their way, they were obliged to pass, for about two miles, over an open plain, directly behind Lord Selkirk's establishment. As soon as they were observed, his people came out in a body, and fired upon them, twice. This was unexpected by the Brulés; neither were they prepared for such an encounter, as many of them had neither gun nor ammunition. Perceiving however, thay they must defend themselves or be cut off, those who had arms returned the fire; and the contest continued, until twenty two of the noble Earl's people fell, and some other were wounded. The Brulés had only one man killed, and one wounded. -- This unhappy affair broke up the colony. Some of the people went to Hudson's Bay; but the greater number returned to Canada. Out of nearly one hundred who came to Athabasca, twelve actually lost their lives by starvation; and all the others must have shared the same unhappy fate, had not the people of the North West company supplied them with provisions. In short, Lord Selkrik lost the last year, in fight and by starvation, sixty eight of his men! and still, with the phrenzy of a madman, he is resolved on pursuing his wild projects. Read other accounts of the Seven Oaks Massacre - enter "Seven Oaks" in the search box to your left. What does Daniel Harmon look like? Check the Beaver Index - enter 'Selkirk' in the keywords field. Compare the account of Seven Oaks by a North West Company employee like Harmon to those of Red River settlers John Pritchard and Alexander Ross. Because Governor Semple and most of his men died that day, most of the available descriptions of the events were from the NWC's point of view.